The EU traces its origins from the European Coal and Steel Community (ECSC) and the European Economic Community (EEC), formed by the Inner Six countries in 1951 and 1958, respectively. The community and its successors have grown in size by the accession of new member states and in power by the addition of policy areas to its remit. The Maastricht Treaty established the European Union in 1993 and introduced European citizenship. The latest major amendment to the constitutional basis of the EU, the Treaty of Lisbon, came into force in 2009. Covering 7.3% of the world population, the EU in 2016 generated a nominal gross domestic product (GDP) of 16.477 trillion US dollars, constituting approximately 22.2% of global nominal GDP and 16.9% when measured in terms of purchasing power parity. Additionally, 26 out of 28 EU countries have a very high Human Development Index, according to the United Nations Development Programme. In 2012, the EU was awarded the Nobel Peace Prize. Through the Common Foreign and Security Policy, the EU has developed a role in external relations and defence. The union maintains permanent diplomatic missions throughout the world and represents itself at the United Nations, the World Trade Organization, the G7, and the G-20. Because of its global influence, the European Union has been described as an emerging superpower..
After World War II, European integration was seen as an antidote to the extreme nationalism which had devastated the continent. The 1948 Hague Congress was a pivotal moment in European federal history, as it led to the creation of the European Movement International and of the College of Europe, where Europe's future leaders would live and study together. 1952 saw the creation of the European Coal and Steel Community, which was declared to be "a first step in the federation of Europe." The supporters of the Community included Alcide De Gasperi, Jean Monnet, Robert Schuman, and Paul-Henri Spaak. In 1957, Belgium, France, Italy, Luxembourg, the Netherlands and West Germany signed the Treaty of Rome, which created the European Economic Community (EEC) and established a customs union. They also signed another pact creating the European Atomic Energy Community (Euratom) for co-operation in developing nuclear energy. Both treaties came into force in 1958. In 1973, the Communities enlarged to include Denmark (including Greenland, which later left the Community in 1985, following a dispute over fishing rights), Ireland, and the United Kingdom. Norway had negotiated to join at the same time, but Norwegian voters rejected membership in a referendum. In 1979, the first direct elections to the European Parliament were held. Greece joined in 1981, Portugal and Spain following in 1986. In 1985, the Schengen Agreement paved the way for the creation of open borders without passport controls between most member states and some non-member states. 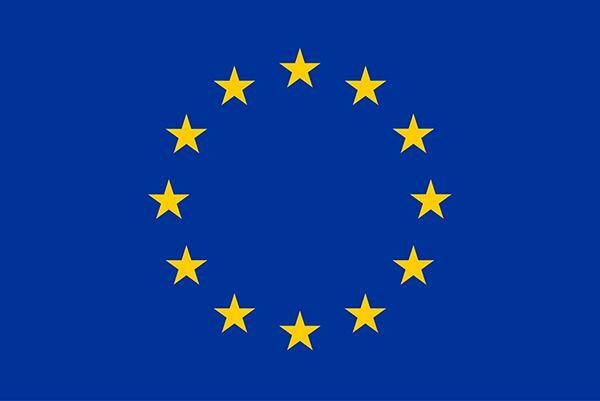 In 1986, the European flag began to be used by the Community and the Single European Act was signed. In 1990, after the fall of the Eastern Bloc, the former East Germany became part of the Community as part of a reunified Germany. With further enlargement planned to include the former communist states of Central and Eastern Europe, as well as Cyprus and Malta, the Copenhagen criteria for candidate members to join the EU were agreed upon in June 1993. In 2002, euro banknotes and coins replaced national currencies in 12 of the member states. Since then, the eurozone has increased to encompass 19 countries. The euro currency became the second largest reserve currency in the world. In 2004, the EU saw its biggest enlargement to date when Cyprus, the Czech Republic, Estonia, Hungary, Latvia, Lithuania, Malta, Poland, Slovakia and Slovenia joined the Union. In 2007, Romania and Bulgaria became EU members. The same year, Slovenia adopted the euro, followed in 2008 by Cyprus and Malta, by Slovakia in 2009, by Estonia in 2011, by Latvia in 2014 and by Lithuania in 2015. From the beginning of the 2010s, the cohesion of the European Union has been tested by several issues, including a debt crisis in some of the Eurozone countries, increasing migration from the Middle East and the United Kingdom's withdrawal from the EU. A referendum in the UK on its membership of the European Union was held on 23 June 2016, with a majority of participants voting to leave. As of December 2016, the UK has not yet initiated the formal withdrawal procedure, and will not leave the EU until two years after it notifies the European Council of its decision to withdraw, or until a withdrawal agreement comes into force. The EU's member states cover an area of 4,423,147 square kilometres (1,707,787 sq mi). The EU's highest peak is Mont Blanc in the Graian Alps, 4,810.45 metres (15,782 ft) above sea level. The lowest points in the EU are Lammefjorden, Denmark and Zuidplaspolder, Netherlands, at 7 m (23 ft) below sea level. The landscape, climate, and economy of the EU are influenced by its coastline, which is 65,993 kilometres (41,006 mi) long. Through successive enlargements, the European Union has grown from the six founding states—Belgium, France, West Germany, Italy, Luxembourg, and the Netherlands—to the current 28. Countries accede to the union by becoming party to the founding treaties, thereby subjecting themselves to the privileges and obligations of EU membership. This entails a partial delegation of sovereignty to the institutions in return for representation within those institutions, a practice often referred to as "pooling of sovereignty". In 1957, when the EEC was founded, it had no environmental policy. Over the past 50 years, an increasingly dense network of legislation has been created, extending to all areas of environmental protection, including air pollution, water quality, waste management, nature conservation, and the control of chemicals, industrial hazards and biotechnology. According to the Institute for European Environmental Policy, environmental law comprises over 500 Directives, Regulations and Decisions, making environmental policy a core area of European politics. Mitigating climate change is one of the top priorities of EU environmental policy. In 2007, member states agreed that, in future, 20% of the energy used across the EU must be renewable, and carbon dioxide emissions have to be lower in 2020 by at least 20% compared to 1990 levels. The EU has adopted an emissions trading system to incorporate carbon emissions into the economy. The European Green Capital is an annual award given to cities that focuses on the environment, energy efficiency and quality of life in urban areas to create smart city. The European Union has seven institutions: the European Council, the Council of the European Union, the European Parliament, the European Commission, the Court of Justice of the European Union, the European Central Bank and the European Court of Auditors. Competence in scrutinising and amending legislation is shared between the Council of the European Union and the European Parliament, while executive tasks are performed by the European Commission and in a limited capacity by the European Council (not to be confused with the aforementioned Council of the European Union). The monetary policy of the eurozone is determined by the European Central Bank. The interpretation and the application of EU law and the treaties are ensured by the Court of Justice of the European Union. The EU budget is scrutinised by the European Court of Auditors. There are also a number of ancillary bodies which advise the EU or operate in a specific area. In 2009 the Lisbon Treaty gave legal effect to the Charter of Fundamental Rights of the European Union. The charter is a codified catalogue of fundamental rights against which the EU's legal acts can be judged. It consolidates many rights which were previously recognised by the Court of Justice and derived from the "constitutional traditions common to the member states." The Court of Justice has long recognised fundamental rights and has, on occasion, invalidated EU legislation based on its failure to adhere to those fundamental rights. Foreign policy co-operation between member states dates from the establishment of the Community in 1957, when member states negotiated as a bloc in international trade negotiations under the common commercial policy. Steps for a more wide-ranging co-ordination in foreign relations began in 1970 with the establishment of European Political Cooperation which created an informal consultation process between member states with the aim of forming common foreign policies. It was not, however, until 1987 when European Political Cooperation was introduced on a formal basis by the Single European Act. EPC was renamed as the Common Foreign and Security Policy (CFSP) by the Maastricht Treaty. However, five countries have reached the 0.7% target: Sweden, Luxembourg, the Netherlands, Denmark and the United Kingdom. The European Union has established a single market across the territory of all its members representing 510 million citizens. In 2014, the EU had a combined GDP of 18.640 trillion international dollars, a 20% share of global gross domestic product by purchasing power parity (PPP). As a political entity the European Union is represented in the World Trade Organization (WTO). EU member states own the estimated largest net wealth in the world, equal to 30% of the $223 trillion global wealth. 19 member states have joined a monetary union known as the eurozone, which uses the Euro as a single currency. The currency union represents 338 million EU citizens. The euro is the second largest reserve currency as well as the second most traded currency in the world after the United States dollar. Of the top 500 largest corporations in the world measured by revenue in 2010, 161 have their headquarters in the EU. In 2016, unemployment in the EU stood at 8.9% while inflation was at 2.2%, and the current account balance at −0.9% of GDP. The average annual net wage in the European Union was around $20,000 in 2015, which was about half of that in the United States. There is a significant variance for GDP (PPP) per capita within individual EU states. The difference between the richest and poorest regions (276 NUTS-2 regions of the Nomenclature of Territorial Units for Statistics) ranged, in 2014, from 30% of the EU28 average to 539%, or from €8,200 to €148,000 (about US$9,000 to US$162,000). In 1999 the currency union started, first as an accounting currency with eleven member states joining. In 2002, the currency was fully put into place, when euro notes and coins were issued and national currencies began to phase out in the eurozone, which by then consisted of 12 member states. The eurozone (constituted by the EU member states which have adopted the euro) has since grown to 19 countries. The Common Agricultural Policy (CAP) is one of the long lasting policies of the European Community. The policy has the objectives of increasing agricultural production, providing certainty in food supplies, ensuring a high quality of life for farmers, stabilising markets, and ensuring reasonable prices for consumers. It was, until recently, operated by a system of subsidies and market intervention. Until the 1990s, the policy accounted for over 60% of the then European Community's annual budget, and as of 2013 accounts for around 34%. As of 1 January 2016, the population of the European Union is about 510.1 million people. In 2013, 5,075,000 live births were registered and 4,999,200 deaths. The net migration to the EU was +653,100. In 2010, 47.3 million people who lived in the EU were born outside their resident country. This corresponds to 9.4% of the total EU population. Of these, 31.4 million (6.3%) were born outside the EU and 16.0 million (3.2%) were born in another EU member state. The largest absolute numbers of people born outside the EU were in Germany (6.4 million), France (5.1 million), the United Kingdom (4.7 million), Spain (4.1 million), Italy (3.2 million), and the Netherlands (1.4 million). The EU contains about 40 urban areas with populations of over one million. In addition to large agglomerations, the EU also includes several densely populated polycentric urbanised regions that have no single core but have emerged from the connection of several cities and now encompass a large metropolis. The largest of these polycentric metropolis include Rhine-Ruhr with approximately 11.5 million inhabitants (Cologne, Dortmund, Düsseldorf et al. ), Randstad with approx. 7 million (Amsterdam, Rotterdam, The Hague, Utrecht et al. ), Frankfurt Rhine-Main with approx. 5.8 million (Frankfurt, Wiesbaden et al. ), the Flemish Diamond with approx. 5.5 million (Antwerp, Brussels, Leuven, Ghent et al. ), Upper Silesia with approx. 5.3 million (Katowice, Ostrava) and Øresund with approx. 3.7 million (Copenhagen, Malmö). The European Parliament provides translation into all languages for documents and its plenary sessions. Some institutions use only a handful of languages as internal working languages. Catalan, Galician, Basque, Scottish Gaelic and Welsh are not official languages of the EU but have semi-official status in that official translations of the treaties are made into them and citizens of the EU have the right to correspond with the institutions using them. Language policy is the responsibility of member states, but EU institutions promote the learning of other languages. English is the most widely spoken language in the EU, being spoken by 51% of the EU population when counting both native and non-native speakers. German is the most widely spoken mother tongue, being spoken by 16% of the EU population. 56% of EU citizens are able to engage in a conversation in a language other than their mother tongue. Most official languages of the EU belong to the Indo-European language family, except Estonian, Finnish, and Hungarian, which belong to the Uralic language family, and Maltese, which is a Semitic language. Most EU official languages are written in the Latin alphabet except Bulgarian, which is written in the Cyrillic alphabet, and Greek, which is written in the Greek alphabet. These are the three official scripts of the European Union. Besides the 24 official languages, there are about 150 regional and minority languages, spoken by up to 50 million people. Although EU programmes can support regional and minority languages, the protection of linguistic rights is a matter for the individual member states. The European Charter for Regional or Minority Languages ratified by most EU states provides general guidelines that states can follow to protect their linguistic heritage. Christians in the EU are divided among members of Catholicism (both Roman and Eastern Rite), numerous Protestant denominations (Anglicans, Lutherans and Reformed forming the bulk of this category), and the Eastern Orthodox Church. In 2009, the EU had an estimated Muslim population of 13 million, and an estimated Jewish population of over a million. The other world religions of Buddhism, Hinduism and Sikhism are also represented in the EU population. According to new polls about religiosity in the European Union in 2012 by Eurobarometer, Christianity is the largest religion in the European Union, accounting for 72% of the EU population. Catholics are the largest Christian group, accounting for 48% of the EU population, while Protestants make up 12%, Eastern Orthodox make up 8% and other Christians make up 4%. Eurostat's Eurobarometer opinion polls showed in 2005 that 52% of EU citizens believed in a God, 27% in "some sort of spirit or life force", and 18% had no form of belief. Many countries have experienced falling church attendance and membership in recent years. The countries where the fewest people reported a religious belief were Estonia (16%) and the Czech Republic (19%). The most religious countries were Malta (95%, predominantly Roman Catholic) as well as Cyprus and Romania (both predominantly Orthodox) each with about 90% of citizens professing a belief in God. Across the EU, belief was higher among women, older people, those with religious upbringing, those who left school at 15 or 16 and those "positioning themselves on the right of the political scale". Cultural co-operation between member states has been a concern of the EU since its inclusion as a community competency in the Maastricht Treaty. Actions taken in the cultural area by the EU include the Culture 2000 seven-year programme, the European Cultural Month event, and orchestras such as the European Union Youth Orchestra. The European Capital of Culture programme selects one or more cities in every year to assist the cultural development of that city. 53 EU cities have been part of this initiative up to 2016. Media freedom is a fundamental right that applies to all member states of the European Union and its citizens, as defined in the EU Charter of Fundamental Rights as well as the European Convention on Human Rights. Within the EU enlargement process, guaranteeing media freedom is named a "key indicator of a country's readiness to become part of the EU".